Assuming we uses 10 bit per key, and the function number k is 3, then the FPR will be 1.74%. Because SSTable access pattern is not uniform. Using uniform size of bloom filter is not efficient. The basic idea is allocate more memory to hot data and less memory to cold data. The solution is building multiple filters when constructing each SSTable, and each filter is usually allocated with smaller memory size, which is called filter unit. Hot SSTable will cache more filter unit in memory. 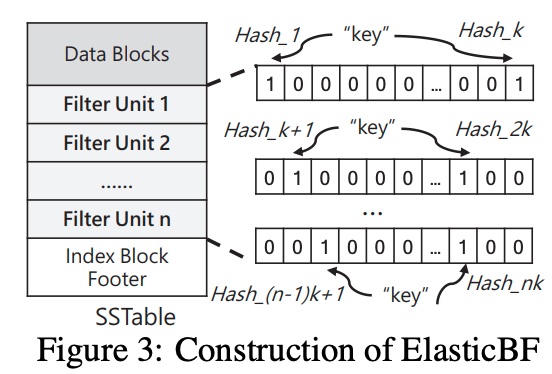 ElasticBF adjusts the number of filter units for each SSTable only when the metric E[Extra IO] could be reduced under the fixed memory usage. This paper maintained a LRU queue. Each element of a queue corresponds to one SSTable and keeps the metadata of the SSTable, including the enabled filter units residing in memory. Qi manages the SSTables which already enabled exactly i filter units, e.g., each SSTable in Q2 enabled two filter units. Each metadata will have a currentTime + lifeTime counter as expiredTime. A read will cause the metadata been updated (update currentTime). I guess those multi level queue is priority queue, sorted by the the expireTime. Then this means every access will first locate the metadata, then reorder the queue. How to located the metadata, brute force? How about the reorder overhead? This Elastic idea is not the first I head. In SIGMOD17, a paper: Monkey, discussed how to use different size of bloom filter for SSTable in different level in LevelDB. Their idea is allocate more memory to higher lever SSTable and less memory to lower level SSTable.